Posted on May 26, 2012 March 22, 2017 by Doug Eisenstark, L.Ac. Xiang fu (Cyperus root) regulates the qi to address frequent sighing or dull tummy aches. This is the formula for the so-called “six stagnations”. Yue Ju Wan was created for “excess” types (even though they may feel tired a lot). Simply put, the systems of digestion, blood flow, fluids and qi / energy are clogged up. When things aren’t flowing well the body’s systems’ functions are compromised. I use this formula for a number of conditions including indigestion, fatigue, insomnia (hard to fall asleep) and heaviness of the body. Also it is very useful for mental conditions including anxiety, depression, frustrations and anger (if the pattern fits the above). Qi stagnation is the name of the game. When we get frustrated by small things that shouldn’t matter or can’t seem to get moving even though we know we “should” then we have qi stagnation. Stagnation can also be responsible for pains that migrate, come and go, are aggravated by stress. These pains tend to radiate and affect an area or region rather than a discrete location. Qi stagnation is addressed by Xiang Fu. Qi stagnation can also cause the other stagnations listed below. Blood stagnation (or “stasis”) causes pains that are fixed in location and usually occur in a location that you can point at with one finger. Blood stagnation is addressed by Chuan Xiong. This stagnation of heat is actually a side-effect of other stagnations. When things aren’t circulating well, the (Chinese concept of the) Liver can get hot, resulting in a short temper, red eyes, etc. Heat is addressed by Zhi Zi. Dampness is another side-effect of qi stagnation, particularly in the Stomach and Intestines. When things are stuck in the tummy, one outcome is the creation of excessive fluids in the Stomach and Intestines which gives rise to indigestion. Damp is addressed by Cang Zhu. Damp + time = phlegm. Sometimes phlegm comes out of the body as we’re accustomed to seeing it, from coughing. In the case of this formula, this phlegm may be more evident after a big meal. Other times, it can coat the poop or show up as lumps in the body. (Lumps are of course potentially malignant tumors and this should be examined by a locally licensed health care provider before going any further…) Phlegm (and damp) is addressed by Cang Zhu. Food stagnation can arise from qi stagnation which is how your Stomach may react to stress, the food just sits there. However over-eating or eating food that is difficult to digest can also cause food stagnation. Food stagnation is address by Shen Qu. This formula is for qi stagnation that then causes all the other kinds of stagnation. 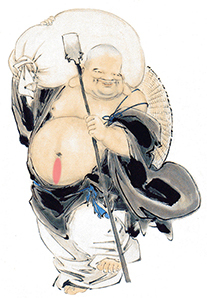 Xiang fu is the herb that addresses the qi stagnation. We use it often for when stress causes frequent sighing on the sensation that one can’t take a full breath of air (due to emotional stress). 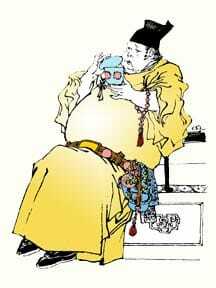 Xiang fu is also famous for bloating or dull achy pain in the upper abdomen. 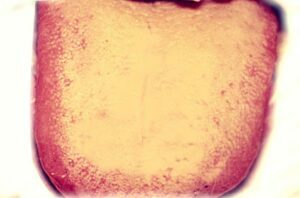 Your tongue may look like this if you need Yue Ju Wan (although this one is a little extreme). Thick yellow coating, red or purplish tongue body. All of these stagnations can warm up the (Chinese concept of the) Liver much like a traffic jam can cause cars to overheat. This herb cools the Liver which helps one to keep their emotional cool in the face of some heavy-duty stress. Qi stagnation that affects the functions of the Stomach and Intestines can cause a lot of gurgling or other issues with the metabolism of fluids. This herb is said to aromatically pierce through damp turbidity. That’s going to result in a cool airy feeling in your tummy which you’ll like. This herb is especially effective in supporting the stomach’s ability to digest fermented foods. Also applies to fermented drinks such as alcohol. However because it is actually a mixture of a variety of digestive herbs, it can help anything stuck in the Stomach to get broken down and moving into the intestines as they should.